A trip to Branson to see Sight & Sound Theatres’ live show, “Samson,” may not fit into your schedule and budget this spring. 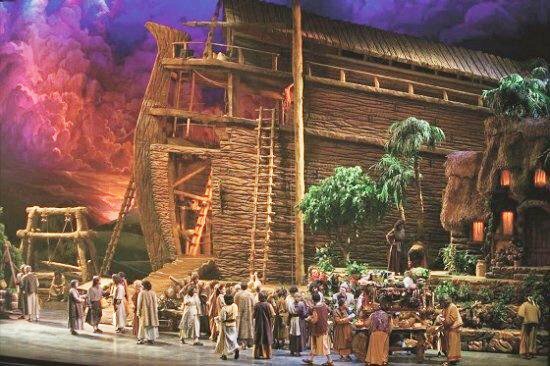 Closer to home and easier on the wallet is their previous production, “Noah,” in select theaters across Missouri, April 9, 11 and 13 (Spoiler alert: There’s a flood in the second act). If you ever have made the trek down to the theatre in Branson, you’ll feel right at home in your local movie theater. True, the close-ups mean you can see things like wireless microphones that would disappear to a live audience seated 50-feet away, and it becomes more obvious that those aren’t real lions in the ark’s stalls. On the other hand, you get a better view of the actors’ faces and expressions, and can better appreciate some of the detail in the amazing sets of the ark’s interior. When the camera zooms out, the sheer scale of the inside of the great ship is remarkable. You also get to experience some of the creativity and ingenuity that comes from live theatre. You wouldn’t think you could make an audience of 2,000 people feel like they’re bobbing up and down on the oceans, but good acting and clever lighting make it happen. And while those may not be real lions on the top floor of the ark, we do see an impressive variety of animal pairs ranging from ducks to camels to parrots to skunks(!) to absolutely stunning long-haired Highland cows marching proudly through the audience up onto the stage two-by-two. Kids will absolutely love this “loading of the ark” scene. But what’s more impressive still is the way the show’s writers are able to tell a faithful version of those three chapters in Genesis while integrating songs, comic relief, and themes that feel very, very relevant. This is first and foremost a story about a man’s obedience to God, but there are elements of family conflict. For example, Noah’s brother is chief among those ridiculing the ark and Noah for his “judgmental, intolerant beliefs” and his ignorant understanding of the world (“Water cannot fall from the sky!”). When local residents seek the safety of the ark, they don’t want to give up the things they enjoy and live the way Noah lives: “I’m not talking about loving Jehovah; I just want to be on the boat when the time comes.” There’s also a parallel to current religious liberty battles, as Noah and his family lose the privilege of operating in the commercial world due to the “passion and danger that come from a fear of Jehovah.” Doesn’t that sound familiar? These messages aren’t explicitly found in Genesis, but they do dovetail perfectly with the way the biblical account is presented and indeed, the rest of Scripture and the gospel. To find a theatre hosting “Noah” screenings (there are 14 of them across Missouri), go to www.noahevent.com.